I was inspired to come up with my own Needle Mat after seeing the one that Carolyn was looking for...thinking I might call it Needle Keeper instead (? )...I am pleased with my test stitch-out...just a little tweak I need to do to the file and it will be good to go! This will come in handy for all of the needles for my machines...decided that when I put in a new needle, I will put a colored pin head in the slot for the needle I am installing...If it is for my Ellisimo, I will use a blue pin head and if it is for the Creschendo I will use a red pin head...and as I change out the machine needles they will go in the correct spot on the mat...I think this will come in very handy. Very nice and neat and easy to read. Enjoy! Great idea! I just finished trying to figure out what needles I had in my machine were and what the ones I had taken out to use a different kind and set aside - whew! what a job! Ah, that's exactly when this little baby comes in handy! 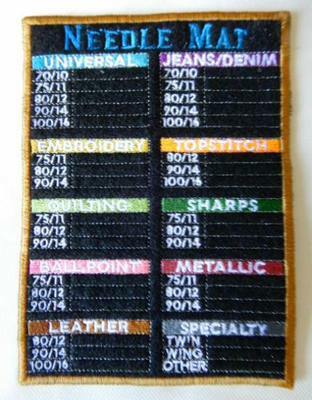 No more guesswork or trying to read the tiny, tiny engraved size on the needle! This one is already in use! Great job, especially the lettering! This is so useful. I've lost track of what the needles are when I change from one type to another. It helps with the labeling on needles, but still it's a problem. Great idea! The lettering is great! It is clear for being so small. I am sure this will be used hard with all the designs and projects you come up with. Looks great. Hopefully your machine will be ready soon. I have the one that was in DBC many years back and use it all the time. I love your idea to use a colored pinhead to mark the type of needle that is in your machine at the time. I find that the older I get, the less I remember! Thanks, Sharon...I'm with you, can't for the life of me remember which needle is actually in the machine! Great job, especially on the tiny letters!! Thanks, Vicki...yes, they are tiny! Thanks Chris, I will investigate that. Sandra. Your design of the needle mat is terrific, and would make great gifts for sewing friends. Nice idea for different colour pin heads to keep track of needles. 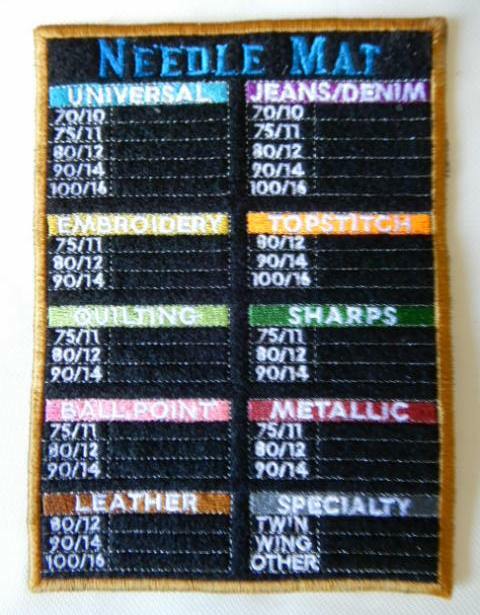 Just another suggestion that you may incorporate, is the amount of stitches for each needle size Sandra. Thanks, Sandra...I will have to think about stitches! Thanks, Kay...good use of the Tomato Pincushion, too! Very well done and practical. A nice gift for any sewer..